This is how this book starts. And it doesn’t forget this beginning. And it is all the more beautiful for it. C.G. Drews has accomplished something memorable and heart-string-snapping in her debut: I care about her main character, so so much. Beck loves music, I truly believe he does, but his mother has confined, constrained, and punished him into only listening and playing classical music. So his view of music is so warped and tragic. He is a born composer but doesn’t trust his own hands and heart. He is a child with no one to turn to with too much of his corner of the world on his shoulders. C.G. Drews captures that desolate feeling so well, and this is a tough book to read, but brilliantly done. His relationship, his awakening with August, is something beautiful to behold. I don’t know; I didn’t see her as a manic pixie dream girl, come to “save” Beck from his situation. She was just lucky in her circumstances, and truly sweet, to reach out to a forgotten friend. We see August through Beck’s scope only: “August’s eyes say she’s never been let down in her entire life. Lucky her.” How is someone so abused as Beck supposed to register or compute someone as light and carefree and shoeless and soul-beautiful as August? This book may be a fast read, but it sticks with you. These characters stick with you, and you just want the best for them. Joey honestly killed me and Beck’s spineless/hopeless/pillar-strong love for her. What can a teenager do in a situation like this? I loved their relationship. This, Joey, is the true catalyst for Beck fightingfightingfighting for his freedom from the Maestro. I’ve been in a K-8 school for a year (my freshest remembrance of how children speak) and Joey rang true for me, and especially Beck’s view of her: something to protect, and keep playful around and encourage, especially when encouraging a kid sister to shut out your love interest is A+++ goals. When August crashes into Beck’s life, it’s a matter of a school assignment, of chance. She seems too good to be true… but the writing buoyed me along. There was cake and contrasting families and heartbreak and tough choices and August was both a huge part of Beck’s clawing his way to the surface of something good and also just an idea. I would definitely read a sequel with these characters, or grasp at authorial shout-outs in other works. Suffice it to say, I ship Beck and August hard because they ground and uplift each other in equal measure. The Maestro is a monster, and is mostly seen through Beck’s eyes… I think this worked well for the story, because (although I didn’t have the physical abuse aspect growing up) I think quite a few of us readers could sympathize with having a parent that is so demanding, so confusingly angry, that you’re stuck. Frozen. Unable to make a choice until it’s almost too late. Beck still loves the Maestro. (How could he not? She’s his mother… no matter what, that connection doesn’t just go away. It really doesn’t. And it is awful… but hopefully you meet many more people besides, who help you, but still.) And I think that’s a great nuance this book achieves, both loving and hating your parents because what can you do. One of the things that really confused/upset me about this book, however // highlight for spoilers: his uncle Jan. What the actual f///. Jan basically mindf///s Beck, acts all scary and slamming sh*t, because he wants to know how the young man truly feels about music?? “I apologize for the theatrics, though, my nephew. I needed to know you honestly.” WHY would you scare an abused child like that?? I just… that baffled me and I hope Beck is okay and again would definitely read a thousand more words of Beck and August Skyping and sending each other snailmail love letters and inspiring each other to be better versions of themselves despite the distance… but I don’t think I’ll ever trust Jan!! It’s about music and breathing it in and screaming it out until it saves you. It’s about those lucky chances to get to connect with someone who might help you through the darkest times. What Beck wants most in the world is to cut off his own hands; what Beck wants most in the world is to live his life on his own terms. And he fights for that, with a little help from his friend, from his sister, from his estranged uncle, but ultimately, Beck pulls everything out of himself to find it within himself to live. And I admire that. And I admire this author for the story she brought to the world. 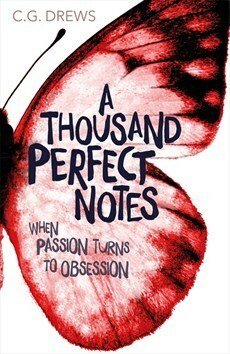 Have you read A Thousand Perfect Notes? What did you think? Did you know you can make a version of the cake from ATPN? I think that’s wicked awesome. First, what an amazing review (as usual). I really feel like I’m there with the characters. It’s such a sad thing when a parent imposes their dreams through their child so they can live their own dreams vicariously. Beck shouldn’t be an extension of herself, he is a whole and complete person that is separate to his mother. I love how you haven’t trivialise August to a manic pixie dream girl, again, they are complete persons too and instead of calling them that, we should call them a good friend instead as you rightly pointed out. Also, the relationship between Beck and his little sister is giving me major Holden and Phoebe vibes. It makes me really happy to see that Beck found it within himself to pluck up his courage. It’s okay to have someone help you and lift you up as well as do it for your own self. Now, I need to add this book to my TBR! Oh I’ve never read Catcher in the Rye so had no idea that he had a little sister. I’ve always meant to pick it up, esp because so many people are split about it. Ahhh this sounds soooo good can’t wait to read!!! 😊🤓😁 !!!! Hope you get the chance soon!